Sometimes being too much of a fanboy can make life difficult. For example, the lack of One Piece this week has me less than excited about writing this column. Sure, the chapters that were in this issue of Shonen Jump were all either quite good or passable, but I can’t help but be far less excited than I would any other week. But, perhaps the lack of One Piece to fanboy over will give me a chance to judge the other chapters just a little bit more fairly. Not only is this the first story in One-Punch Man that isn’t over in one chapter, it’s also the first time when the joke is the exact opposite of of the past four chapters. Saitama, despite all his strength, finds himself helpless against his sole mosquito tormentor. That’s the sign of good comedy, establishing the status quo, and then breaking said status quo for the sake of laughs. We also get introduced to another hero, a cyborg. We’re past the introductory chapters here, and it’s time for the world to be expanded. 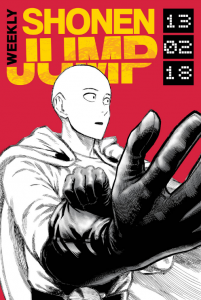 I look forward to seeing how Saitama and this new character interact, since the expanded cast will be crucial to the manga. There’s only so much one can do with variations on the same joke, so hopefully we’ll get a more expanded world after this upcoming story. As for this chapter, I’m liking the second Hokage a lot. I would have been saved a lot of grief were he still the leader of Konoha. Just imagine it, five minutes after Sasuke leaves the village for the first time Tobirama would have dragged him back in a body bag. It’s a shame that didn’t happen, but one can dream, and after all, that is what fanfiction is for. A lot of not much happens this chapter, mostly we get the Hokage talking about how they need to go take care of Madara, and then we go into a flashback of the first Hokage and Madara fighting. The amount of flashbacks in this series of late has been rivaling the anime for quantity. Hopefully the quality will be somewhat improved. Most of the chapter was focused around Yuma being the fish out of water, which may be an old trope, but if handled well it could be interesting enough. We do get to learn a little more about the Neighbors, I am moderately interested to see what the deal is with these two worlds, so for the moment World Trigger continues to have my interest. At least we got to see Unohana’s bankai (not that we know what exactly it does) before she apparently died. I’m of two minds about how this could go. On the one hand I would be disappointed if Unohana permanently dies so soon after becoming interesting. Then again, I wouldn’t be surprised if Kubo doesn’t go through with killing her. 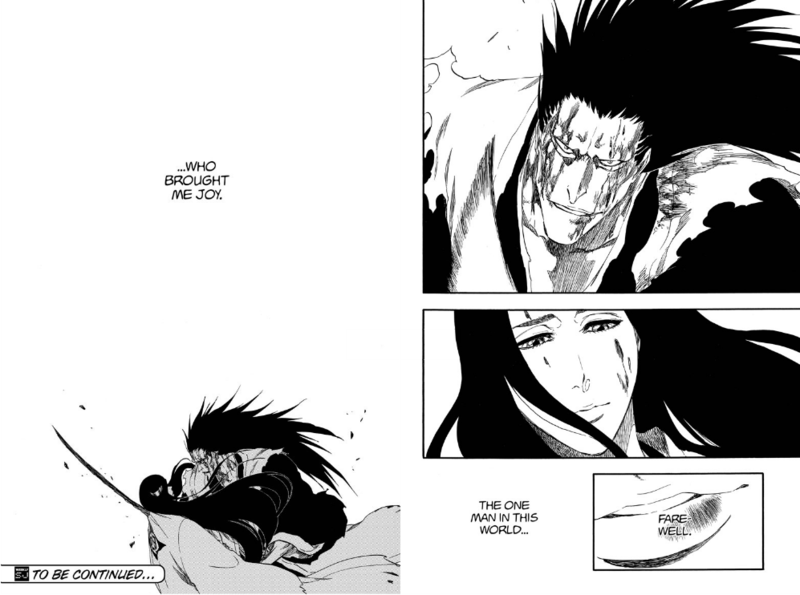 Perhaps Kenpachi’s shikai will be released next chapter and it has some kind of healing powers. Unlikely, but I would be amused by the idea of Kenpachi, whose entire being revolves around fighting, has a shikai that can’t cause any damage. Unohana’s motivations for learning how to heal work for her characterization, though I have to wonder, if she’s so enamored with fighting, why haven’t we seen her actually fight until now? She may have learned how to heal so that she can keep fighting people, but how does that fit in with her doing nothing but healing for the entire series? 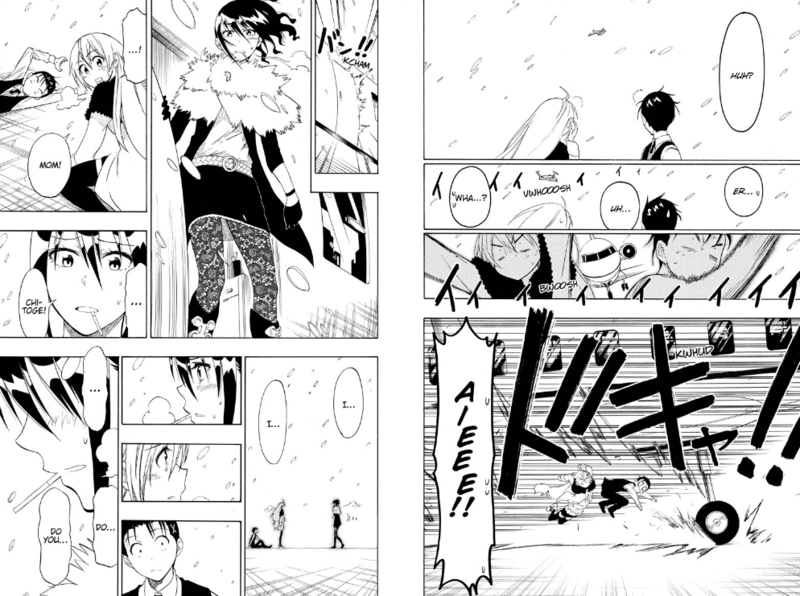 While I prefer Nisekoi when it’s being funny, and not serious, I really liked this chapter. Granted the issue between Chitoge and her mother was resolved much faster than I’m used to with manga, but at least it provided a satisfying ending to this story without overstaying it’s welcome. That and seeing Hana almost run them over with her plane was priceless. This chapter was mostly touching, with just enough humor that it makes for a great resolution to this plot line. Setsuno vs Chiyo. Granted Chiyo hasn’t been around as long in this series, but when she made her entrance she made it in a big way. And to finally see her and Setsuno face off just goes to show how epic this story is going to be. Not only that but we finally get to see what Setsunos’ specific power is. Personally I could have done without the cooks having their own fighting powers, I thought the idea was that they were skilled in different ways than the Gourmet Hunters. BUt really I’m just amazed at how many creative powers can be built around cooking concepts. And Setsuno’s is possible one of the coolest, and overpowered ones that I’ve seen in a long while. Not much to say about this chapter, except that I look forward to next week. While most of this chapter focuses on Sakurai and Toyoguchi finally talking about their “confession” from last chapter, I am pleased to note that next chapter will give us some more character development with at least two more of the girls from the team. Most of the time Cross Manage feels like it doesn’t know what to do. Having a large cast means that the girls should all get their time in the spotlight, but it seems like what this series was supposed to be was a romance, with little interest in the sport or the characters playing it. Which is a shame, because I don’t know how well adapted the current Shounen Jump is to dealing with romances. There are always a few in the lineup, but they never seem to last very long. Still, for now I’ll enjoy what I can get of the cast, and hope that somehow Cross Manage survives the next round of cuts. Now we’re talking. Finally the big reveal that most likely caught readers of Dragon Ball in the day off guard. Not only is Goku an alien, but Raditz, the stranger confronting him, is his brother. I’ve always wondered what Dragon Ball would have been like, had Goku not lost his memory when he was a baby. It probably wouldn’t have been the hit that it is, and Goku probably would have been a lot smarter, but I would have loved to see some kind of “what if?” scenario. But, again, that’s what fanfiction is for. Though, Raditz’s story has a bit of a flaw in it. Granted in general the earth population is weaker than even a Saiyan child. But Dragon Ball had plenty of strong characters that Goku had a hard time beating. Perhaps his transformation would have given him the strength to wreak havoc, but it isn’t like someone such as Master Roshi couldn’t handle it. Sure Goku was stronger in that form, but Roshi already knew what to do. Aka/ destroy the moon. So most likely Goku would have ultimately failed in his mission. Unless of course he was able to grow stronger with his memories intact, perhaps through some kind of Saiyan training. Or perhaps his viciousness as a child would have enhanced his strength. Either way, while this chapter may have been a shark jumping moment for some back in the day, by this point it holds up well enough and this was the first chapter so far that really caught my interest again. If you want to hear more, check out the Manga^3 archives. For last week’s episode check out Episode 035 – February 11, 2013 – What is Shonen Manga? | Shinmai Fukei Kiruko-san.